Employee or Sports Lockers both require a premium fabrication and an eye for rugged detail. Employee Lockers with stainless steel handles are practical and sanitary too. Accommodates twice as many people as single tier lockers in the same floor space, while still providing enough room for light outer wear and personal belongings. Also known as "box lockers" for their compact dimensions, multiple tier lockers allow numerous users in the smallest amount of floor space. They are available in 3, 4, 5 and 6 tier configurations. 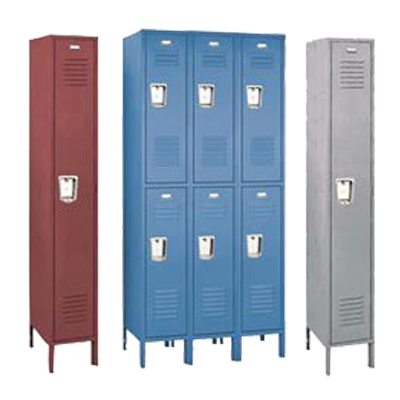 These lockers are ideal for storage of athletic gear or employee personal storage. Each compartment can be locked with padlocks or built-in locks.